Escape the pressures of everyday life and relax in the privacy of our welcoming atmosphere. Look out at the horses grazing on the pasture. The cottage has a gated entry. Our cottage is equipped with a full kitchen, flat screen television with satellite, wi-fi, queen-sized bed, and a queen-sized sofa sleeper in the living room. Enjoy the welcoming goody basket, complimentary beverages, and breakfast items in the refrigerator. Relax on our porch rockers and take in the country beauty. Call us at 254-933-3109 or 254-289-3115 or e-mail us today to book your reservation, take a tour of our facilities, or to purchase a gift certificate. Prices listed are for two people. Please add $10 for each additional person. Allow one pet with a $12 per day additional charge plus deposit. 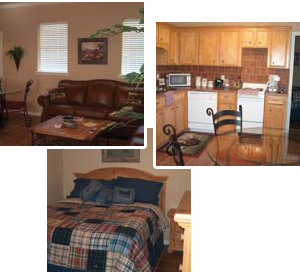 We provide special rates for weekly and monthly rentals, military, and senior citizens. For a full refund on your deposit, please cancel 72 hours prior to your reservation. All rates are subject to applicable taxes.